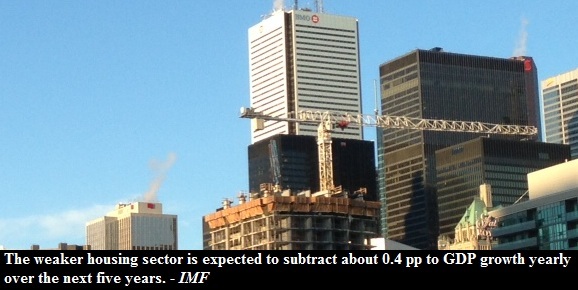 At the end of 2011, IMF originally reported (pdf file) that the Canadian housing market is overvalued. Nothing has changed since than and if anything the problem just got worse. Recently IMF published another report (pdf file) in which it suggests that Canada's housing is over valued by about 10% to 15% with biggest over evaluation in Ontario. In this blog post I will summarize key points from the report and include a few scary graphs. Price-to-rent ratio is 60% above Canada's historic average. Price-to-income ratio is 40% above historic average. There is evidence of over building, for instance IMF notes that residential investment just reached a two-decade high of 7% of GDP. Most of excess housing supply is concentrated in Ontario and Quebec. Mortgage rates will begin to increase in the end of 2013. IMF expects a soft landing. Home equity extraction to fall by half. Housing starts to fall to around 165,000 units per year over next three years. Worst case scenario is price declines of 18% nationally by 2017 if employment levels remains at 2012 level. Overall I think that the IMF report is overly optimistic even in their worst case scenario. I don't think there would be a soft landing, especially in Toronto and Vancouver. IMF assumes falling unemployment and growth above 2% through 2018. I don't think that is going to happen just by looking at the first chart above. IMF expects the residential investment to fall to 6% average. I think it will fall more than that. When housing goes down, it will drag the whole economy with it. Finally, IMF says that housing starts are going to gradually decline to about 165,000 new homes over the next three years. Well, we are already below that number, as housing starts fell 18.5% to 160 577 new units per year.